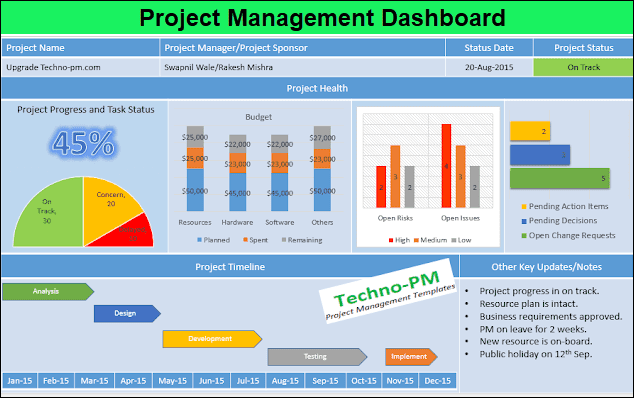 A project management dashboard is a handy tool for any project manager to give the project status in a snapshot. A dashboard should be able to convey the status of important project parameters visually. Covers the critical project management parameters with visual graphs for easy visualization. Covers project schedule, budget, risks, issues and change management. The Schedule section allows to update % complete, and task breaks up - On Track, Concern and Delayed. The Budget section caters for different expense categories like Resources, Software, Hardware, and others. Each category allows Planned, Spent, and Remaining costs. Provides an option to visualize the project timeline. As the timeline is manual it can be changed as per needs. The Risks and Issues section allows high, medium and low open items to be displayed. Open Change Requests, Action Items and Pending Decisions can be displayed in a graph. A free-form update for any other project activities and essential attributes like project name, project manager etc. are also covered. As it is PowerPoint based dashboard it can be used to combine and report multiple projects. And it is available to download and customize as per your needs !!! The Project Management Dashboard contains 3 main sections - Project basics, Project Health and Project Timeline, and Key Updates. The project basics section has Project Name, Project Manager/Sponsor, Status Date, and Project Status. All of them are text fields and can be modified as per requirement. 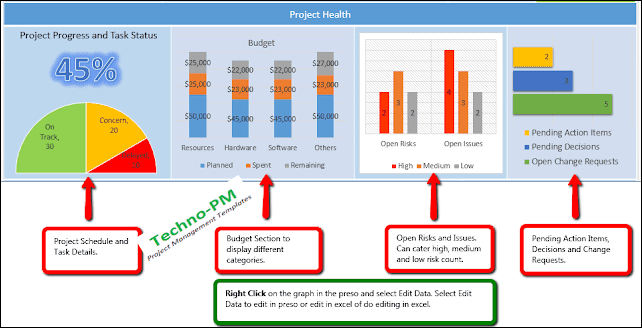 Project health has 4 graphs - Schedule, Budget, Risks/Issues, and Change Requests. You can edit the data by right-clicking on the graphs. You will have two options to modify the data. First("Edit Data"), you can do an edit in the presentation. You can edit the data but cannot column/field names. Second("Edit Data in Excel"), you can do an edit in excel which will allow editing data and do any other changes to the columns/fields. The project timeline is manual and does not use any graphs. It can get a bit cumbersome to use but provides a lot of flexibility as you can change the timeline to reflect days/weeks/quarters and add new project phases without much of change. 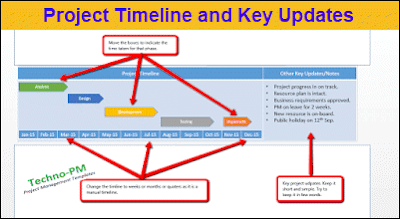 The timeline should be used only for high-level project plan or phases. The other vital updates and notes should be used to provide a brief update on project activities. The updates should be kept as short as possible.